Isn’t each name special? Something to be praised and cherished. A gift given with such thought and love. Sure there may be many Susans and Johns, but each one is unlike any other. One Susan may be named in memory of a friend and another named to honor a Grandmother. One John may have gotten his name because it started with a J and another because it was the American equivalent of Juan. No two are the same really. Each individual, with their own personality, looks, heritage, family and name is completely unique – one of a kind – never seen before – never to be seen again. Sometimes, I know, we don’t want to announce our kids’ names to the world, for safety reasons. Having a child’s name visible on their backpack, jacket, hat, shoes, bike, and lunch box can lead to real problems. But kids do love to see their names printed on their things, so it’s best to just keep the personalizations to possessions that stay at home. I have a great idea that fills all these requirements – PERSONALIZED SHEETS. I have made a set for each of my grandchildren for their birthday this year. It is easy, fun and each kid always knows where his sheets are! First, start with a set of sheets to fit the child’s bed. That will usually be a twin, which can often be found on sale. I recommend you wash the sheets before you start sewing, so all the shrinking, etc. happens before you do all the work. You will need to purchase fabric that coordinates with the sheets. This is the fun part! You can feature a favorite hobby, place, action figure, color or anything that will make the sheets special for your particular child. Yardage is variable, but if you need to make a pillowcase, it will take about 1 yard. If you are only applying a border on a ready made pillowcase and sheet, it will take about 1 yard. If the design on the fabric needs to be placed in a certain way on the border, it may take more. Be sure you measure first! And wash the fabric before you start. A regular pillowcase measures 20″ X 30″ when finished. Start with a 41″ X 34 1/2″ piece of fabric. This will eventually be folded in half on the long measurement, but for now, leave it unsewn. On the short edge, 4 1/2″ will be folded under for the border of the casing, so to embroider the name, center it above that line. 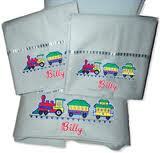 Do the embroidering, by hand or machine, before the 4 1/2″ casing is folded under. That way all the stabilizing will be covered. Now fold in half on long measurement with right sides together. 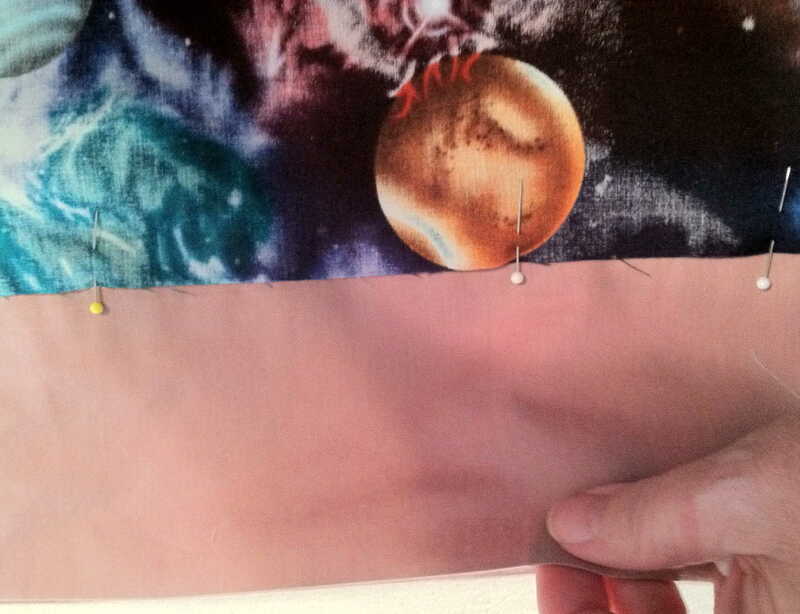 Sew long edge with 1/2″ seam. On bottom edge press up 1/2″, then press up 4″ casing and sew in place. 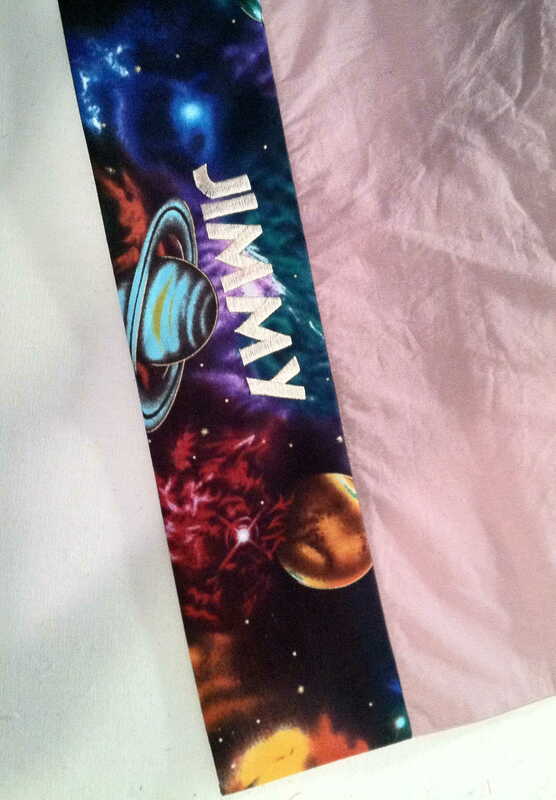 The pillowcase is done, personalized and very special! 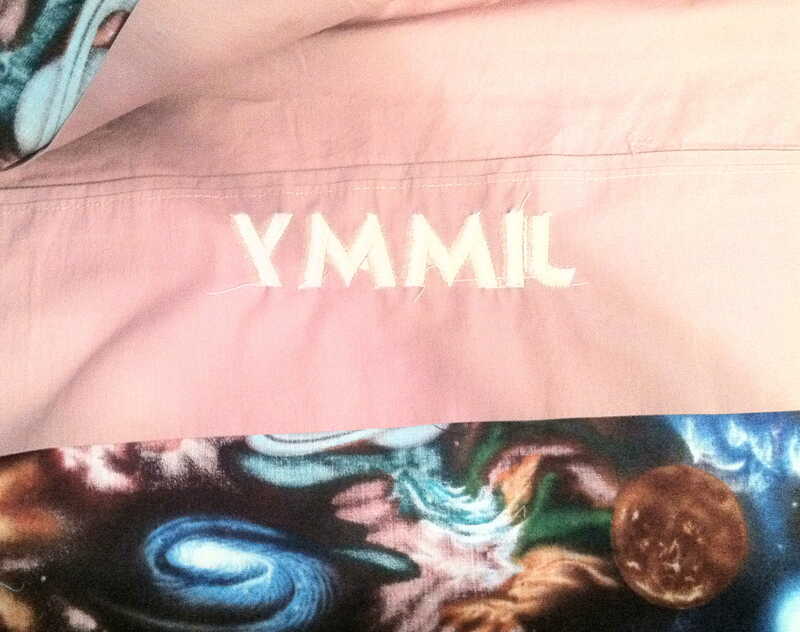 First, open one side seam of the pillowcase. 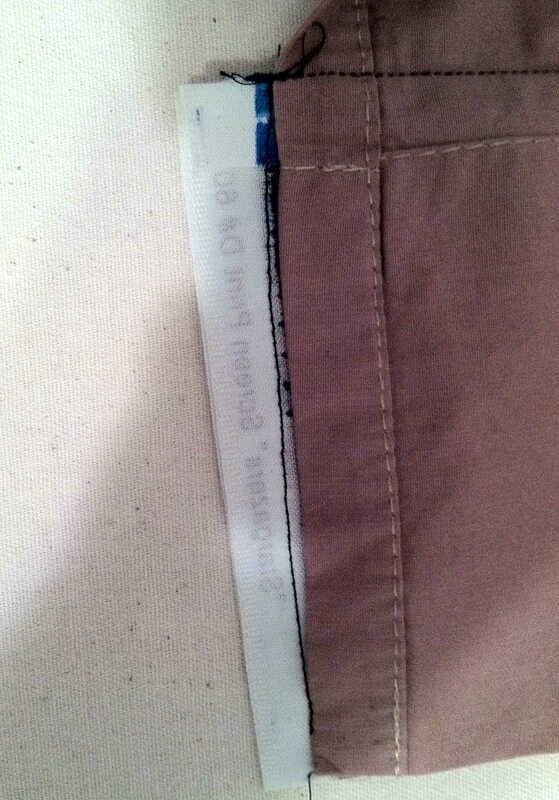 Measure the casing of the pillowcase length and width. Double the width and add 1″. For example: If pillowcase border measures 4″ X 41″, the size of fabric needed is 9″ X 41″. Apply fabric to pillowcase with right sides together. Place lower raw edge of fabric 1/2″ down from upper edge of pillowcase border and sew with 1/2″ seam. Fold fabric down (right side should now be up) and press. Embroider by hand or machine as in “making a pillowcase.” When done, resew the side seam that you opened earlier including the added border fabric. Now press under 1/2″ of raw edge. 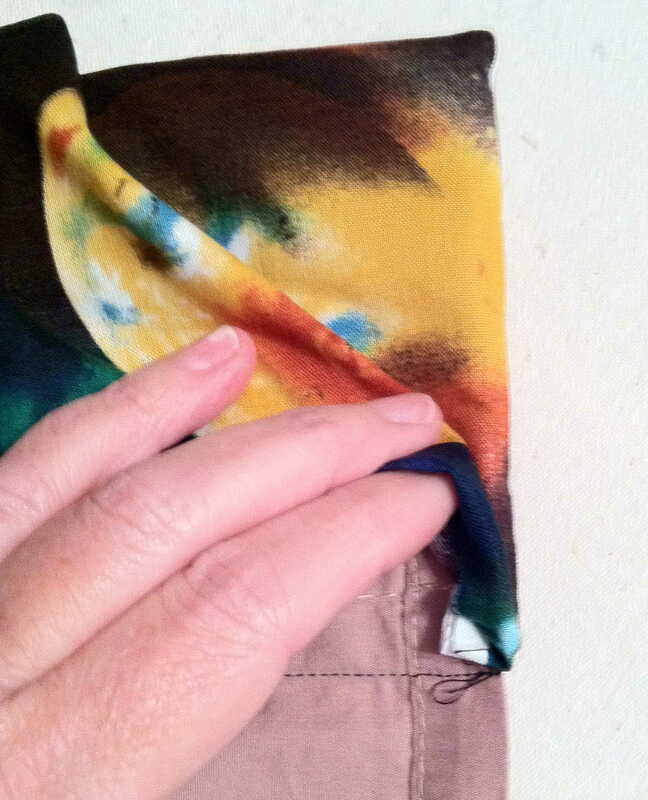 then press under the width of the border and sew in place. The fancy pillowcase is done and belongs to that one special person! Measure the casing of the sheet length and width. Add 1″ to length. Double the width and add 1″. For example: If sheet border measures 4″ X 65″, the size of fabric needed is 9″ X 66″. The length will require you to piece the fabric together as most fabrics are 42-44″ wide. I suggest that you do not make a seam down the center of the border. That area will always be very visible. It will look much better to use one piece of fabric the full length (42-44″) and add the needed inches evenly at both ends. That will give you two seams, but they will be much less visible on the bed. Apply fabric to sheet with right sides together. Place lower raw edge of fabric 1/2″ down from upper edge of sheet border and sew with 1/2″ seam. Fold fabric down (right side should now be up) and press. Proceed with embroidery by hand or machine, if desired. 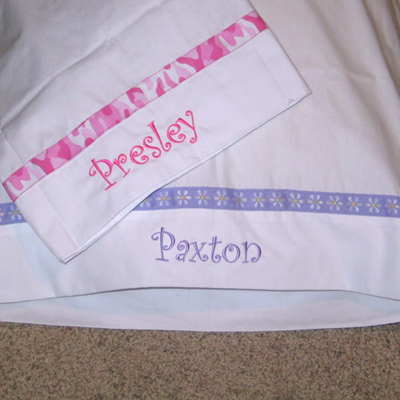 Remember that embroidered letters will face in different direction on the sheet than they did on the pillowcase! Press under 1/2″ of raw edge , then press under the width of the border. Fold and overlap ends of fabric at each end of the border. Sew all edges in place. Now you have the most wonderful and unique set of sheets to give to your special someone. In fact, my niece, when she saw the sheet sets I was giving to the kids, said, “I want some fancy sheets, too!” So these are not just for the kids, but the kid in all of us. Gosh, I want a set too! This entry was posted in In the Sewing Room, In the Village and tagged craft, gift, name, personal, sewing, sheets by The Village Granny. Bookmark the permalink. I love your blog, it’s nice when you can tell somebody actuallly puts effort into a site, and gives the blogs. Thank you. I do try and I do care very much! Come by and visit again! I like your writing style truly enjoying this site. “Make no judgements where you have no compassion.” by Anne McCaffrey. Thanks. I do what I can. Come visit me again.